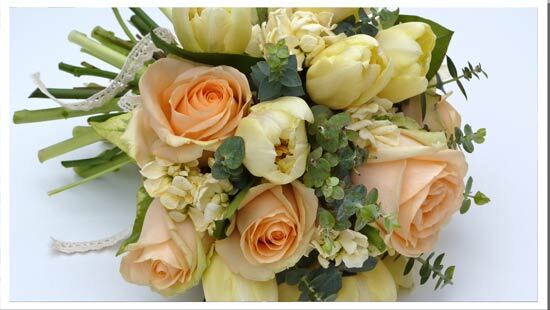 In Springtime, May flowers can bring some of the most beautiful of the seasons blooms to use in your wedding bouquet and table arrangements. By May, the spring season is in full swing and the winter is well behind us. Have a look at our photos of previous bridal flowers in May and see some of the potential for your own wedding flower ideas. 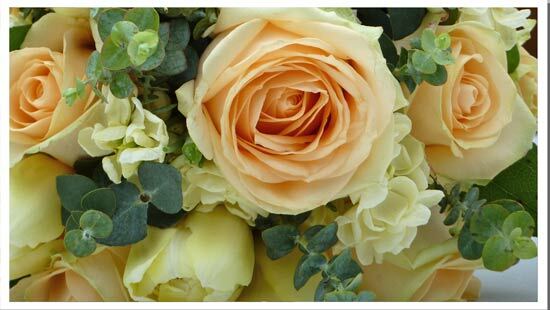 In the beautiful wedding bouquet above, pale cream roses are mixed with pearly white bouvardia to give a fresh take on a classic look. I love the soft citrus mix of colours, against the grey eucalyptus foliage. A very fresh Spring bouquet, heavily scented with cream stocks. Simple painted pots with scented flowers to add fragrance and twinkling candlelight for a country wedding. 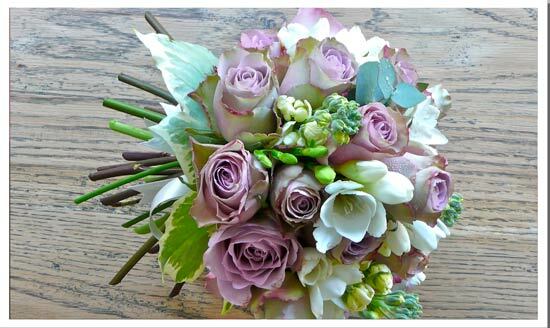 In the bouquet above, vintage dusky pink roses are mixed with white freesia and cream stocks and framed by variegated ivy leaves for a soft timeless and beautifully scented wedding flower bouquet. 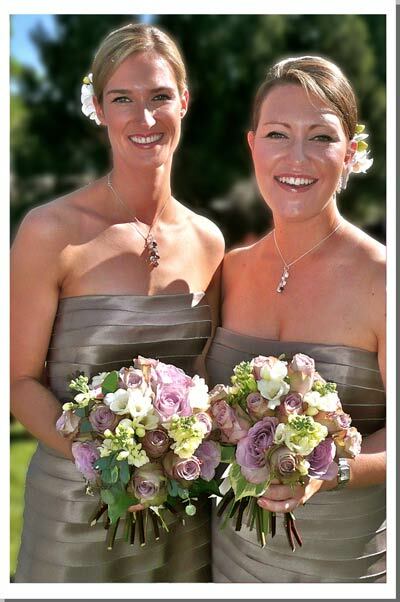 The vintage colours of the bouquets compliment the mink colour of the dresses perfectly. 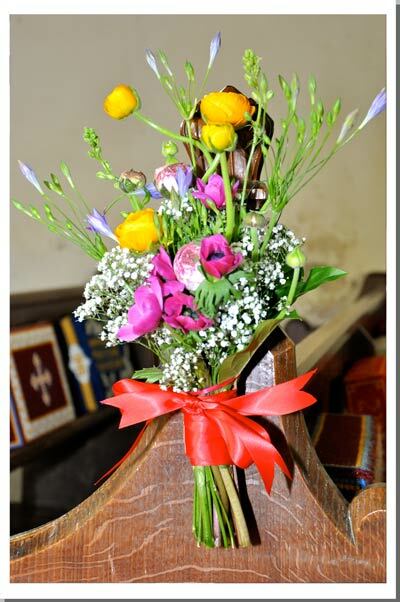 Buttercup yellow ranunculus, cerise anemones, blue brodea and white gypsophila make a cheerful bunch for pew ends. Each bunch was tied with a different colour bow for this fun and eclectic Cheltenham wedding. Talking of bright colours! 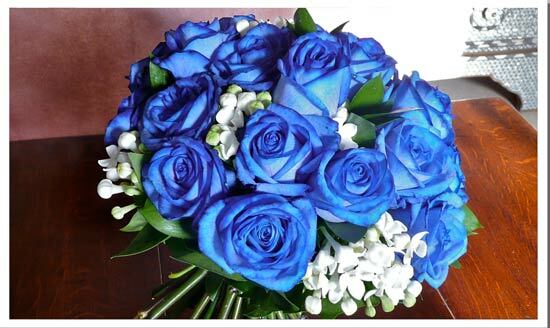 - These died blue roses were just what the bride wanted for her wedding in May. Catherine managed to get them to fit the brief exactly, just as she will with your wedding flower ideas, whatever your style of taste. Everything that Rose and Grace do is done for you not for our convenience. 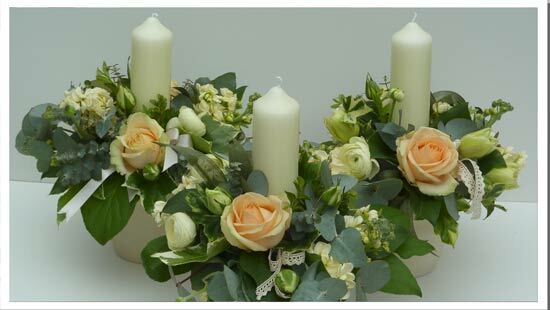 Flowers are ordered specifically your each wedding to ensure that the prefect combination of flowers are available to suit you and your day. 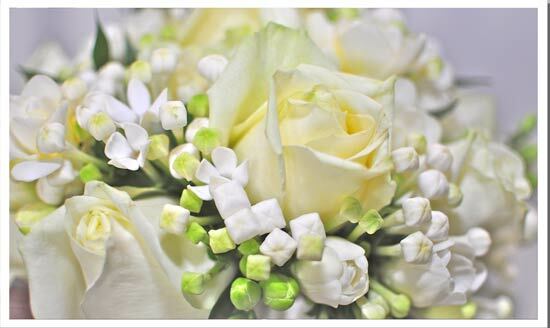 To begin the process of choosing your wedding day flowers, get in touch with Catherine today by phoning 01386 832120. You can fill in our simple contact form, if you prefer, and we will get back in touch as soon as possible. 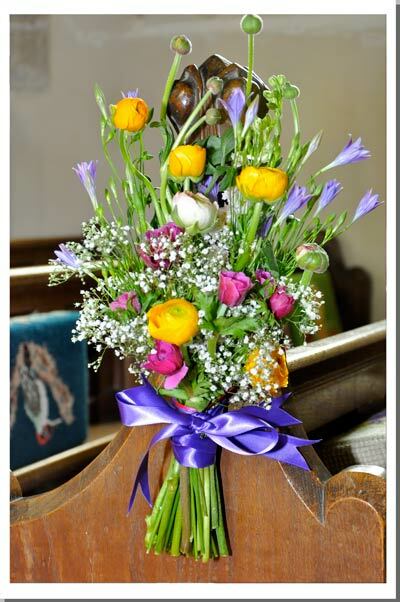 To return to our Wedding flowers by Month page, from this page about May flowers, please follow this link.